Colonel L. George Van Syckle, VCASNY, MA, FSA Scot. ARMS: Gules a garb or between three sickles blades serrated argent handled of the second, a bordure azure. SOURCE/NOTES & CREDITS: Arms: From the Matriculation of Arms dated 30 May 2008 which is registered on page 14, volume 88, in “The Public Register of All Arms and Bearings in Scotland”. 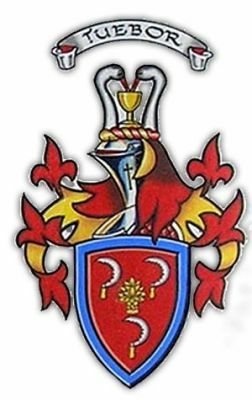 The armiger, born on 2 October 1925 was intensely interested in heraldry and genealogy and to further those interests, collected books, stained glass, silver, paintings, documents, etc. As a close friend, we had many happy discussions of heraldic matters and he was one of a tiny group of us who traveled together to a number of Highland Games distant to us in the Eastern Half of the US. George was a senior officer in the Veteran Corps of Artillery, founded in 1790 in the State of New York, it is one of the eight oldest Historic Military Commands in the US. He was a Member of the Holland Society as his direct male ancestor came to the Colonies in the 1650s and his descendants became English subjects in 1687. He also at Lord Lyon Blair’s invitation, attended an investiture of the Order of the Thistle in Edinburgh and whilst there stayed at the New Club. George was part of a group of friends who purchased land in the Orkney Islands of Scotland. His lands, in fact, march next to our own. The armiger has the differenced arms of a determinate cadet of the Name, House and Arms of Van Syckle. Unfortunately we lost him due to a sudden death on 19 October 2008 at the age of 83. Pray for his soul !